Laubach Literacy trains and supports volunteers who provide free, student-centered tutoring to adults seeking to learn English and to understand U.S. Culture. 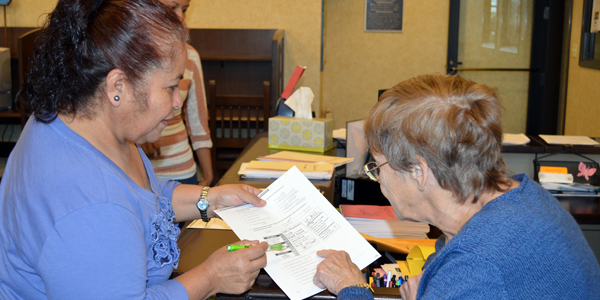 Trained volunteers provide free one on one ESL tutoring to any Ventura County resident who is 18 or older. Laubach Literacy offers a conversation class three times a week in the Homework Room. Volunteer tutors meet with English learners who want to improve their speaking skills. The class meets for 90 minutes Tuesdays at 6 p.m., Wednesdays at 1 p.m. and Fridays at 10 a.m. New students may join any time. Volunteers can attend training to gain the skills necessary to tutor Laubach students. Volunteers also have the opportunity to help recruit new students and volunteers, and to support literacy in Ventura County. For more information, please visit www.laubachventura.org, or email info@laubachventura.org.